MP4 video format is frequently used worldwide as it provides a high quality container for video and audio codecs. This is also used for the advanced formats such 2D and 3D graphics however if you’d like to save the videos in the DVD then MP4 format is not helpful for you. You should convert your videos from MP4 to DVD format to play on a DVD player. In this article, we’re going to introduce you several helpful video converters that can help you to convert MP4 to DVD videos. 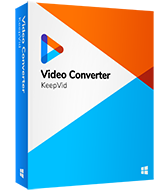 KeepVid Video Converter is a piece of helpful software to help you out to convert MP4 to DVD or any other format you need. This convert program enables you to convert videos in batch together with 30x faster real-time converting speed. In this part, we’re going to show you how to use this video converter to convert MP4 to DVD format. Convert videos to more than 1000 video and audio formats. Easily edit videos with trimming, cropping and effects features. Download video from more than 10,000 video sharing sites. Convert videos with 30x faster video conversion technology. Step 1. Start KeepVid Video Converter and add MP4 video to the program. Step 2. Select DVD as an output and click the Convert button. Step 3. When the conversion finishes, go to Converted tab and find your converted video. 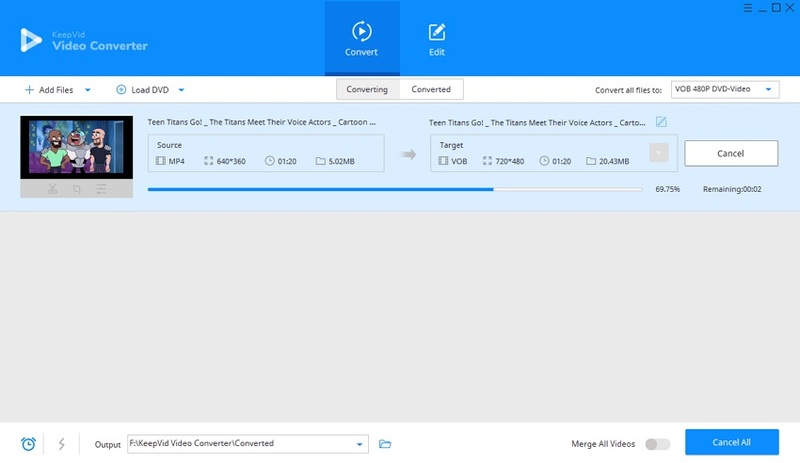 Firstly, download and install KeepVid Video Converter on your computer, then start it. After that, click the Add File or Add Folder button to add the MP4 video to the program window, or you can drag and drop the video files into the software window. Now you can click the inverted triangle icon at the right side of the Target area, and select DVD-supported VOB format as an output. Or click the inverted triangle icon at the right side of the Convert all files to button, and choose VOB as an output in the pop-up dialog. Then click the Convert or Convert All button to start converting MP4 to DVD. After clicking the Convert button, KeepVid Video Converter will start converting MP4 to DVD format. The program will show you the converting process. When the conversion finishes, you can go to the Converted tab to find the converted video. You can also right-click the converted video and choose Open File Location to find the video in your computer. You can use the searching feature of the program to find the output format. Move your mouse to the thumbnail of the video to use the Edit feature. Check the size before starting to convert videos. In this part, we're going to introduce you the top MP4 to DVD online and desktop video converters. 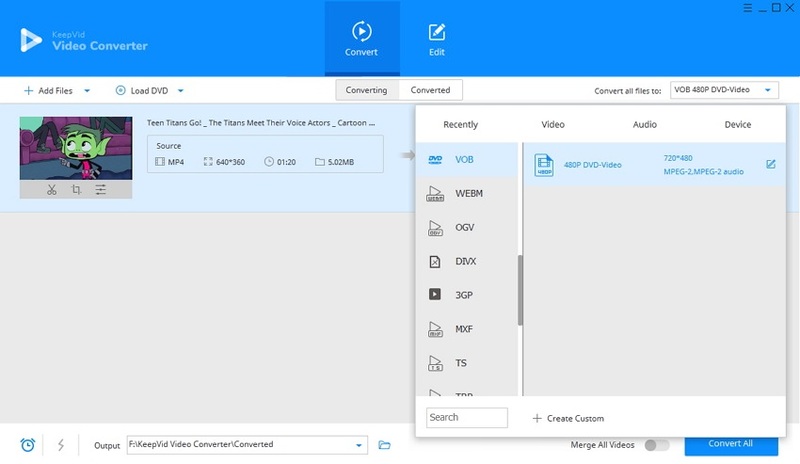 KeepVid Online Video Converter is another way to convert videos, and it doesn’t ask you to install any other third-party software. But you’ll need stable Internet connection to use this online converter. It provides you a very easy and convenient way to convert MP4 to DVD format. It supports 50 popular audio and video formats to convert audio and video files. DVD Maker software is especially designed to burn videos to DVD and converts MP4 videos to DVD format automatically while burning. This is a desktop program and allows you to make DVD from .avi, .mp4, .mov and few other formats. This is an ultra HD video compressor/ converter program for Windows OS. It gives you helpful features that you need so you can quickly convert or edit videos or you can download online videos and convert them in the needed format. These all MP4 to DVD converters work fine to convert MP4 to DVD format. If you are looking for perfect all-in-one software then you can give a try to KeepVid Video Converter, because this program enables you to convert MP4 to DVD in easy steps and also helps you to convert videos to any format you want. If you don’t have videos in your system, you can download videos from the online video sharing sites.